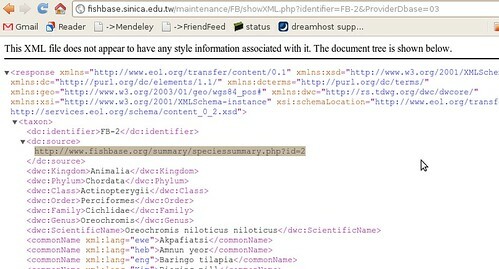 January 20, 2012 / pcwainwr / Comments Off on Is your phylogeny informative? Yesterday my paper [cite]10.1111/j.1558-5646.2012.01574.x[/cite] appeared in early view in Evolution,As the open access copy doesn’t appear on pubmed for a while, you can access my author’s copy here. so I’d like to take this chance to share the back-story and highlight my own view on some of our findings, and the associated package on CRAN.Just submitted, meanwhile, the code is always on github. I didn’t set out to write this paper. I set out to write a very different paper, introducing a new phylogenetic method for continuous traits that estimates changes in evolutionary constraint. This adds even more parameters than already present in rich models multi-peak OU process, and I wanted to know if it could be justified — if there really was enough information to play the game we already had, before I went and made the situation even worse. Trying to find something rigorous enough to hang my hat on, I ended up writing this paper. There’s essentially three conclusions I draw from the paper. AIC is not a reliable way to select models. Certain parameters, such as \(\lambda\), a measure of “phylogenetic signal,” [cite]10.1038/44766[/cite] are going to be really hard to estimate. BUT as long as we simulate extensively to test model choice and parameter uncertainty, we won’t be misled by either of these. So it’s okay to drink the koolaid [cite]10.1086/660020[/cite], but drink responsibly. I really have two problems with AIC and other information criteria when it comes to phylogenetic methods. One is that it’s too easy to simulate data from one model, and have the information criteria choose a ridiculously over-parameterized model instead. In one example, the wrong model has a \(\Delta\)AIC of 10 points over the correct model. But a more basic problem is that it’s just not designed for hypothesis testing — it doesn’t care how much data you have, it doesn’t give a notion of significance. If we’re ascribing biological meaning to different models as different hypotheses, we need want a measure of uncertainty. 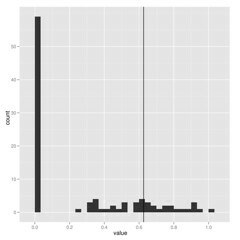 The substantial overlap in the likelihood ratios after simulating under either model indicate that we cannot choose between BM and lambda in this case. I’ll leave the paper to explain this approach in more detail, but it’s just simulation and refitting. You could just bootstrap the likelihoods or for nested models, look at the parameter distributions, but you get the maximum statistical power from the ratio (says Neyman-Pearson Lemma). Many users don’t like going between ouch format and ape/phylo formats. The pmc package doesn’t care what you use, feel free to mix and match. In case the conversion tools are useful, I’ve provided functions to move your data and trees back and forth between those formats too. See format_data() to data-frames and convert() to toggle between tree formats. The package is designed to make things easier. It comes with a vignette (written in sweave) showing just what commands to run to replicate the results from the manuscript. This entire project has been documented in my open lab notebook from its inception. Posts prior to October 2010 can be found on my OWW notebook, the rest in my current phylogenetics notebook (here on wordpress). Of course this project is interwoven with many notes on related and more recent work. As we discuss in the paper, simulation and randomization-based methods have an established history in this field[cite]10.1371/journal.pbio.0040373[/cite], [cite]10.1111/j.1558-5646.2010.01025.x[/cite]. These are promising things to do, and we should do them more often, but I might make a few comments on these approaches. We are not getting a real power test when we simulate data produced from different models whose parameters have been arbitrarily assigned, rather than estimated on the same data, lest we overestimate the power. Of course we need to have a likelihood function to be able to estimate those parameters, which is not always available. It is also common and very useful to assign some summary statistic whose value is expected to be very different under different models of evolution, and look at it’s distribution under simulation. This is certainly valid and has ties to cutting edge approaches in ABC methods, but will be less statistically powerful than if we can calculate the likelihoods of the models directly and compare those, as we do here. Here are some pictures of our Cal Academy team measuring fish in the project room at the California Academy of Sciences in SF. The lab has been coming here since the summer, and with the help of two undergraduates are measuring morphology on close to 250 fish species. Since there were four of us today, we needed more space and worked on display so all could see us dangling fish from sutures to get photos for center of mass estimates. It’s been a while since we had a new video to post, and this will be a quick one, but it is a pretty interesting fish. We recently got some new fish in the lab, including some dragonets from the family Callionymidae. These fish are mainly found in the Indo-West Pacific in tropical waters and are typically benthic. Some from the genus Synchiropus are found in the hobby industry, but are apparently tough to maintain because they feed on benthic invertebrates. We have two species in the lab currently and have started trying to film them. One, we have had some success with, the fingered dragonet (Dactylopus dactylopus). From the videos below you can see a couple of interesting features of this fish, one is that the first two fin rays of the ventral fins are modified for walking along the bottom. This is similar to Inimicus didactylus, which you can see in a few posts back, that has the first two pectoral fins rays modified for walking. The other unique feature of this fish is the way it feeds, which is pretty different than a lot of the videos we have posted, and the topic of Sarah’s (new grad student in the Wainwright lab) dissertation. It has some pretty unique jaw protrusion! My treebase package is now up on the CRAN repository. (Source code is up, the binaries should appear soon). Here’s a few introductory examples to illustrate some of the functionality of the package. Thanks in part to new data deposition requirements at journals such as Evolution, Am Nat, and Sys Bio, and data management plan requirements from NSF, I hope the package will become increasingly useful for teaching by replicating results and for meta-analyses that can be automatically updated as the repository grows. Please contact me with any bugs or requests (or post in the issue tracker). 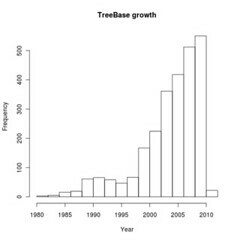 Downloading trees by different queries: by author, taxa, & study. More options are described in the help file. (This query could also take a date range). How do the weekly’s do on submissions to Treebase? We construct this in a way that gives us back the indices of the matches, so we can then grab those trees directly. Run the scripts yourself to see if they’ve changed! Now get me all of those treebase trees that have appeared in Nature. Which authors have the most submissions? Crous, Pedro W. Wingfield, Michael J. Groenewald, Johannes Z.
Donoghue, Michael J. Takamatsu, Susumu Wingfield, Brenda D.
They fit a variety of diversification rate models avialable in the laser package, which they compare by aic. Yup, their result agrees with our analysis. 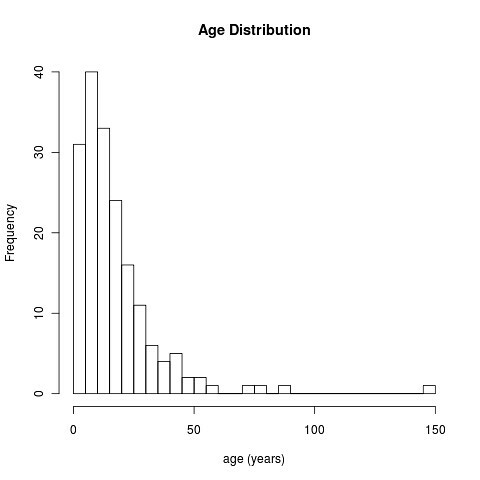 Using the extensive toolset for diversification rates in R, we could now rather easily check if these results hold up in newer methods such as TreePar, etc. Of course one of the more interesting challenges of having an automated interface is the ability to perform meta-analyses across the set of available phylogenies in treebase. As a simple proof-of-principle, let’s check all the phylogenies in treebase to see if they fit a birth-death model or yule model better. Return only treebase trees that have branch lengths. This has to download every tree in treebase, so this will take a while. Good thing we don’t have to do that by hand. Using phylogenetic comparative methods warrants a basic understanding of the history and progress of this field. Working with some of the more recent tools for comparative evolutionary biology, I feel compelled to find out how current methods were devised, whom to credit for the methods I use, and what assumptions I am making by using them. Below is a list of some of the landmark papers in comparative methods, with comments and synopses (written by me and Tomomi). Felsenstein (1981) describes the basics for creating a maximum likelihood tree from a set of nucleotide sequences. One step elaborated from his 1973 paper is Felsenstein’s pruning algorithm for calculating the likelihood of a phylogenetic tree given branch lengths and tip values. This algorithm makes likelihood calculations more computationally efficient by eliminating redundant calculations. The paper also describes the Markov process for finding the maximum likelihood tree from nucleotide data. Felsenstein uses a substitution model for molecular phylogenetics in which each nucleotide has a different stationary frequency (A, C, G, and T are not expected to be equally represented at any given site on DNA sequences). Methods for searching tree space have been improved, and Bayesian theory has since permeated phylogenetic analyses, but the pruning algorithm continues to be an important subroutine in phylogenetic computations. Possibly the most cited paper in phylogenetic comparative methods, Felsenstein (1985) describes with clear examples why species trait values may not be statistically independent and what might be done to compensate. Felsenstein elaborates on his method of calculating standardized contrasts (phylogenetically independent contrasts) to help overcome the non-independence of character traits. 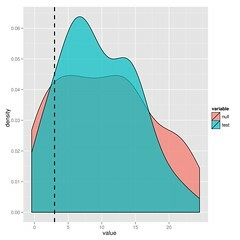 These contrasts are basically the differences between trait values of species pairs weighted by the evolutionary change separating them; they are estimates of the rate of change over time. A common use of standardized contrasts is to look for correlation in this rate between two traits; if standardized contrasts of traits X and Y are compared in a regression analysis, a linear trend suggests correlated rates of evolution between the traits. Schluter et al. (1997) discuss the need for error estimates on ancestral state reconstructions. The paper introduces maximum likelihood ancestral state reconstructions of both discrete and continuous characters. Responding to Schluter et al.’s call to account for error in tree construction, Huelsenbeck et al. (2003) describe a Bayesian method for mapping the change in character states onto a phylogeny. The introduction reiterates the importance of having an alternative to parsimony methods when tackling character change; as with maximum likelihood, the new methods allow for more than one change along a given branch in the tree. While the Huelsenbeck et al. paper is a landmark for evolutionary analysis, it also contains a very coherent introduction to the instantaneous rate matrix, substitution model, and likelihood calculations for finding the probabilities of evolutionary histories. Although Brownian motion is often used to model quantitative character evolution, the Ornstein-Uhlenbeck (OU) process can also be used to develop informative evolutionary models. OU models incorporate selection as a selective optima, or adaptive peak. OU and Brownian motion are not entirely unrelated as OU collapses to Brownian motion in the absence of selection. Butler and King (2004) use OU to test which of several evolutionary models has the best fit to several example data sets involving anoles. They use likelihood ratio tests to determine how various OU-based models perform against Brownian motion, observing that biological information is important in determining what models to consider. They also stress that stasis, although positive support for stabilizing selection, is often disregarded and can lead to underestimation of evolutionary drift. However, although they state that Brownian motion is a pure drift process, Brownian motion can provide a good fit to selective schemes under fluctuating directional selection (O’Meara et al. 2006). While Grafen (1989) first describes a generalized least squares model for phylogenetic regressions, Chris O. from our lab pointed out the appendix of a paper on mammal intestines (Lavin et al. 2008) as a nice summary of PGLS. This appendix describes both the history and the methods of phylogenetic regression analysis. PGLS can be performed not only under a Brownian motion model, but also with OU and several other transformations of the variance-covariance matrix used in the mixed model approach. These are just a handful of important papers; feel free to add to the list via comments with other references and their contributions. 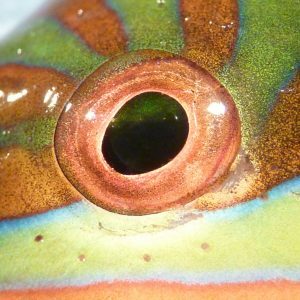 We’ve had some great posts on Fishbase and fish eyes recently, thanks to Carl and Lars. Most of the lab is working on abstracts for SICB 2012, so let’s get back to some fish videos. 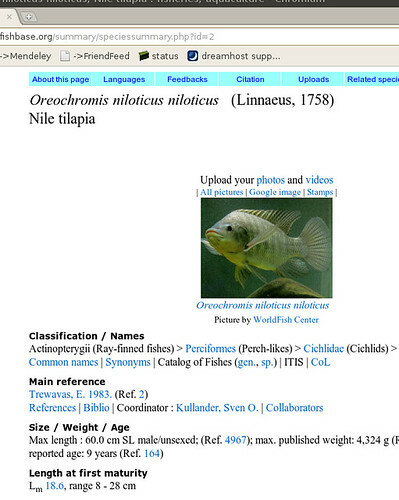 This week’s contender is Petenia splendida, a fish-eating cichlid from Central America. If you saw one of this in a fish store, it would probably be called a “red bay snook”. The name isn’t particularly accurate: the fish is rarely red, doesn’t live in a bay, and isn’t a snook. What this fish does have, though, is an impressive set of jaws for capturing prey. Petenia splendida is an impressive piscivore (fish-eater) that has some of the most protrusible jaws of any cichlid.